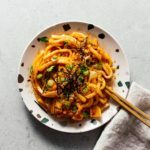 One of the best noodle dishes you could ever make - spicy, tangy, delicious, and dead simple to make. It’s true, there are fields and fields of rice and it is decidedly less cosmopolitan than the other major cities in Japan, but it has a charm all its own. The people are friendly and the food is good – what more could you want? The first place we ate at was a little izakaya that kind of reminded me of home. We have a ton of great izakayas in the city and one of our faves does this crazy delicious kimchi mentaiko udon that I love. 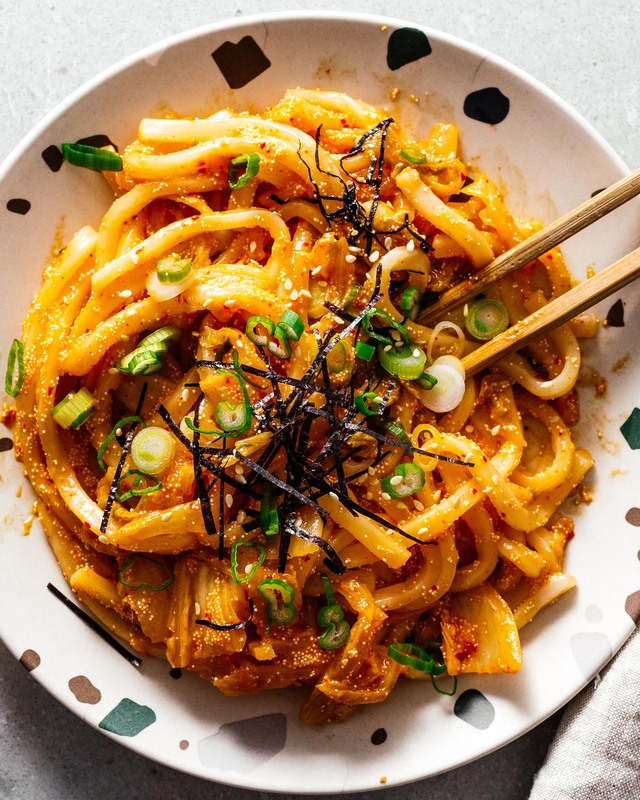 You’ll see plate after plate of it head out of the kitchen: a tangle of firm, yet chewy udon noodles coated in a butter, kimchi, spicy cod roe mixture. Have you had mentaiko before? 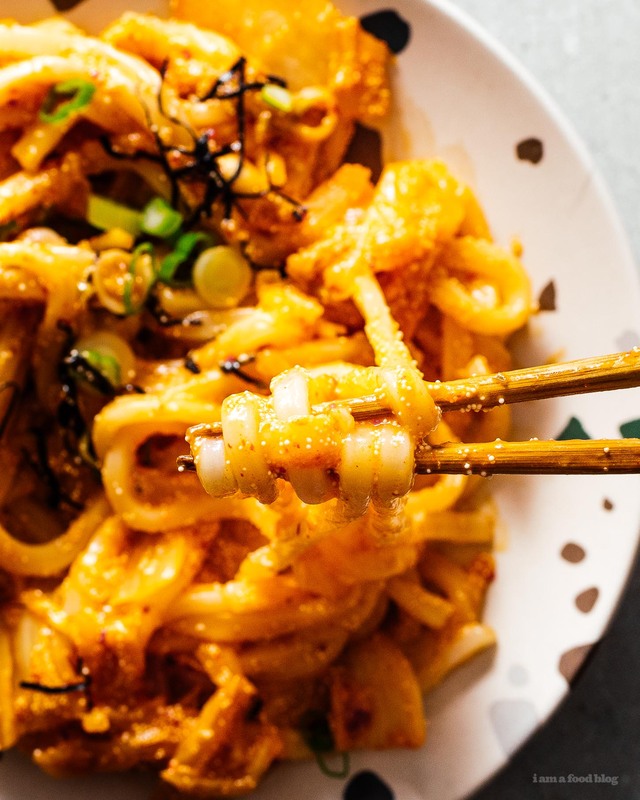 It’s a Japanese take on a Korean spicy salted cod roe – basically spicy fish eggs that add a huge hit of flavor to rice, noodles, eggs…essentially anything and everything you can think of. 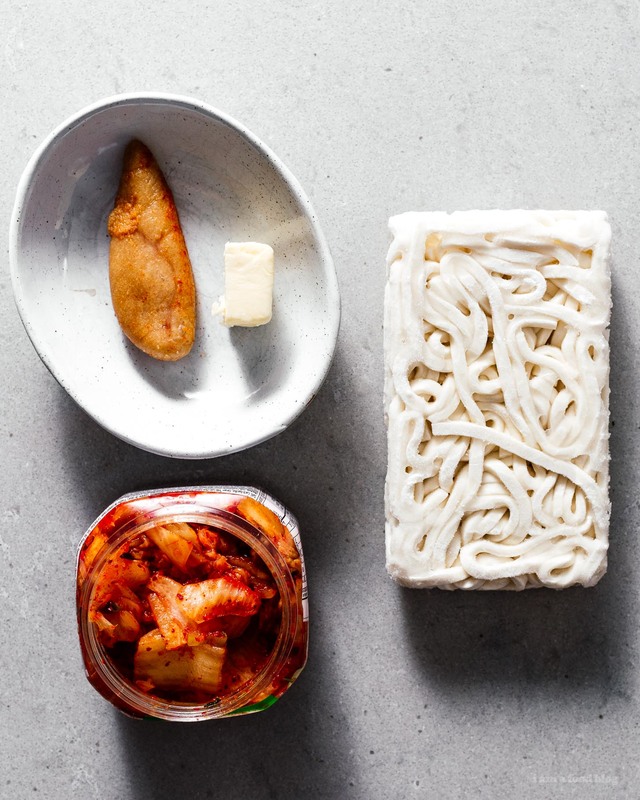 It goes exceedingly well with kimchi and even better with noodles. This has got to be one of the easiest noodle dishes you’ll ever make. The payoff compared to the effort you put in will blow you away. Of course, you have to go to the Asian grocery store to get the mentaiko, which might be a pain, but hey, while you’re there, you can stock up on the snacks, am I right? 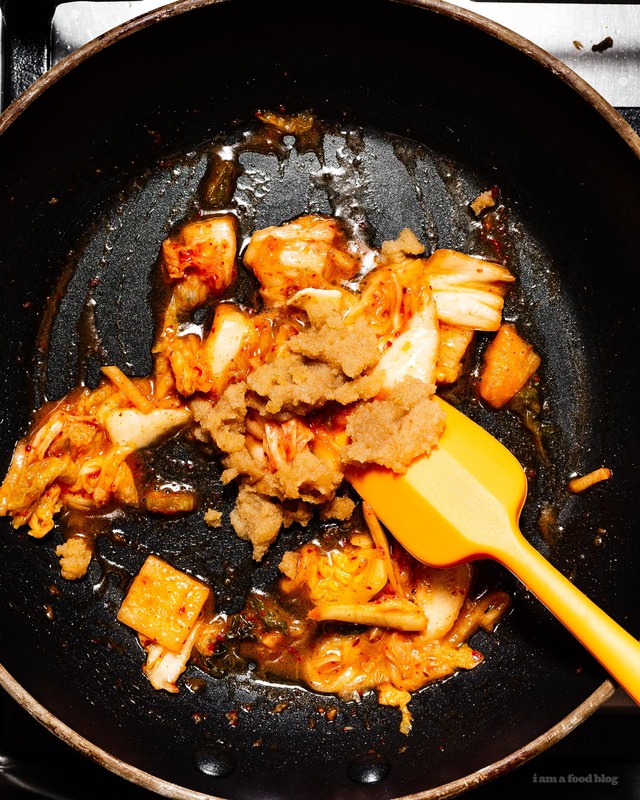 And, if you absolutely can’t make it to the store and only have kimchi and butter in the fridge, that’s pretty darn good on it’s own. 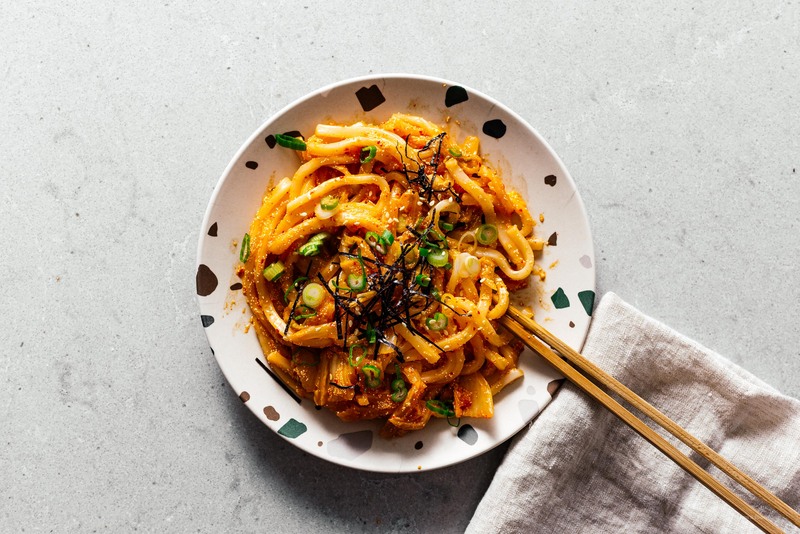 Kimchi butter noodles are where it’s at, the mentaiko just takes it over the top. Cook the udon according to the package and drain well. 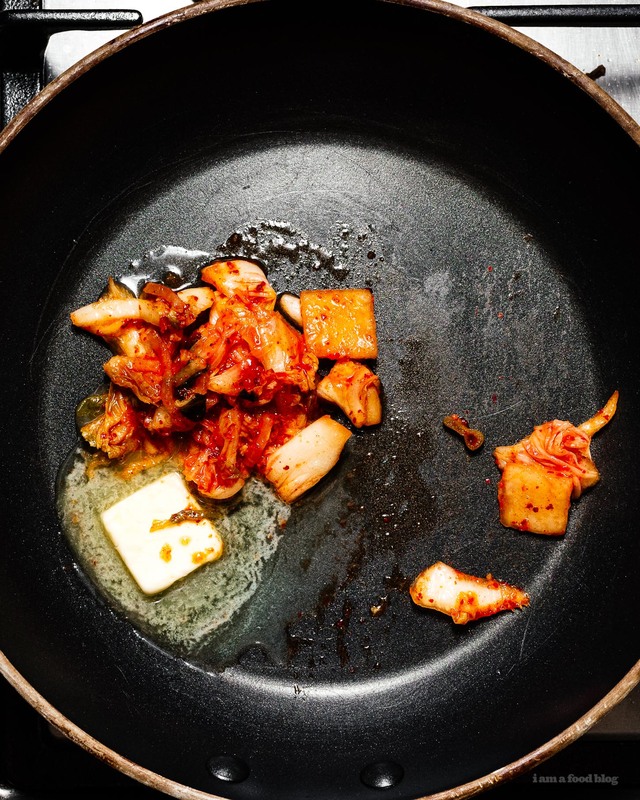 Melt the butter over low heat and add the kimchi, frying slightly. Remove the roe from the sac by cutting open with a knife and using a spoon to scrape out the eggs. Add to the butter and kimchi. Toss in the udon and mix until well coated and glossy. Top with green onions and nori. Enjoy hot! Is Mentaiko the same as Bottarga, or karasumi? similar, but mentaiko isn’t dried, the fish eggs can separate, so you don’t do the grating/slicing thing. This looks great. I love spicy foods.